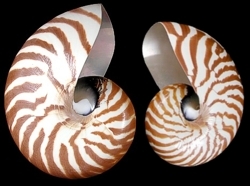 Nautilus are a favorite decor item for sailors, boaters and sea-side stylists alike. Their larger shells and spiraling design add volume and motion to a room, a table or a bookshelf. 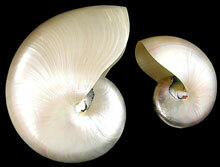 The Nautilus' name is derived from the Greek word for "Sailor." Nautiluses are only found in the Indo-Pacific, from 30° N to 30° S latitude and 90° to 175° E longitude. They inhabit the deep slopes of coral reefs. Nautiluses usually inhabit depths of several hundred metres. It has long been believed that nautiluses rise at night to feed, mate and lay their eggs. As the nautilus matures it creates new, larger chambers, and moves its growing body into the larger space, sealing the vacated chamber with a new septum. The chamber increase in number from around four at the moment of hatching to thirty or more in adults.